1. Solar Charging effect will be subject to sunlight intensity and local weather. It's only recommended for EMERGENCY use, please DO NOT take it as primary power resource. For daily use, please use provided charging cable via outlet to charge the power bank.
. Please fully charge power bank before first use. 3. For your safety, please DO NOT put it on your car dash for solar charging ; Please DO NOT leave it in the car in summer. High temperature in car may damage it. 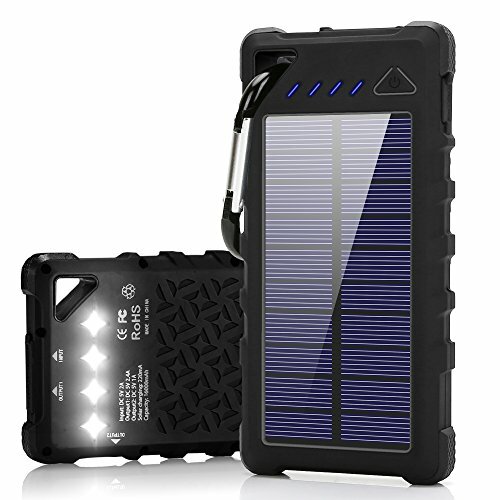 Why You Need FKANT 16,000mAh Solar Charger ? -16,000mAh high capacity power bank, recharge your devices on the go. -Large solar panel, recharge the battery via sunlight. Green energy, and environmental. -ABS+PC plastic material, rugged heavy-duty design, shockproof and dust-proof. -Dual USB Ports(1A/2.4A), charging two devices at the same time. -IPX7 waterproof certified, resisting 3ft of water up to 30 minutes (Waterproof Lip Closed). -Ideal for outdoor life, such as Hiking/Climbing/Camping/Traveling, etc. -4 ultra-bright LED flashlight, could be torch or SOS light for emergency in dark. -4 LED pilot lights for battery level indication (25%, 50%, 75%, 100%). -With a clip, you could hang the power bank on your backpack. -Compatible with most devices, such as iPhone iPad Samsung android phones tablets. A Must-Have Backup Emergency Kit for Hurricane Season !【Certified IPX7 Waterproof】IPX7 waterproof rated, up to 3 feet of water for up to 30 minutes (Waterproof lip closed). Rugged heavy-duty design, rain-splashy, shock-proof. 【Huge Capacity】Portable battery pack with 16,000mAh power capacity. With Dual USB ports(1A/2.4A), you could charge two devices at the same time on the go. Effortlessly charge your smartphone, tablet, or other portable device quickly and conveniently. 【Emergency Solar Charger】A large solar panel in front, which could recharge the battery itself via sunlight for EMERGENCY purpose while outdoor activities like Hiking/ Climbing/Camping. 【Outdoor Life Saver】Built-in Ultra-Bright 4LED Flashlight, which supports 3 modes (Normal / SOS / Strobe) for your convenience and emergency use in dark; 4 LED pilot lights for battery level indication (25%, 50%, 75%, 100%) and power type indication( Green light flashing when charging via sunlight, blue light when charging via electricity). 【A Safe Charger】 Throw your old external battery charger. For your safety, FKANT power bank provides multi-protections to protect itself from overload, overvoltage, overcurrent, overcharge, over-discharge, over-heating. If you have any questions about this product by FKANT, contact us by completing and submitting the form below. If you are looking for a specif part number, please include it with your message.